Ivan Kristoff will showcase the world’s landmark buildings in a very prestigious way during the Dubai Helishow 2016, which will be held at the Meydan Racecourse. At this event, Ivan has a booth, a photo exhibition and a multimedia presentation of innovative concepts for vertical and aerial rescue. One of his presentation is called “Creating a H.E.A.R.T. for megacities” and a workshop for Highrise Emergency Aerial Response sTrategy. 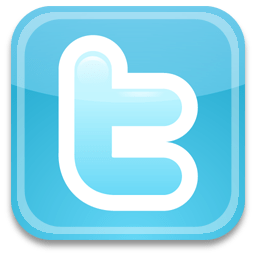 For this project, you can visit the website aerialrescue.com, where you can find some interesting articles and ideas related to safety and rescue from tall buildings. Soaring at extreme heights, some of the landmarks of Dubai are officially certified by the Guinness World Records as the world’s tallest buildings and hotels. Ivan Kristoff will publish soon the EXTREME Magazine with a special edition for his projects. Aerial and remote access photographer, Ivan Kristoff, has traveled the world to capture visuals in countries such as USA, Russia, Dubai, Hong Kong, and England on projects ranging from Discovery Channel documentaries to short commercials. As a new filmmaker, Ivan seeks to combine his passion for extreme sports and activities with powerful story telling. This was most recently recognized by a Swiss Made watch company inviting Ivan to become an executive promoter and Brand Ambassador for Swiss Made professional watches. Ivan is writing, directing and producing short films for the world’s tallest buildings, in the narrative category. 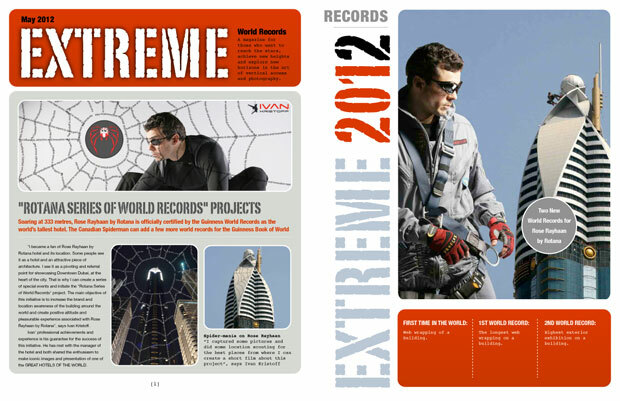 The project will be called “W.W.W.”, the abbreviation of Web Wrapping of the World’s tallest buildings. “W.W.W.” sequence will be filmed for the very first time in Dubai, UAE. In a few sequences, some of the films will tell the stories of Ivan Kristoff’s experience with local emergency services personnel. One of them is with the New York State Park Police in Niagara Falls, where Ivan was responsible for the safety of the Discovery Channel TV crew. Ivan has studied IT communications in the University of Toronto and Cinema & TV Production in the New Bulgarian University. In his new project, a short film documentary called “S.O.S.″, Canadian filmmaker Ivan Kristoff is taking us on his journey of creating a volunteer rope rescue team that sets new trends in the rope access environment and vertical access operations at extreme heights. 5 years ago, he created the “Special Operation Services“, aka S.O.S. team, a one-of-a-kind organization, specialized in rapid access emergency response to hard to reach places. The film takes place in Bulgaria, the director’s native country, in remotes areas, high in the mountains, in the air and high above the urban environment of Sofia. The premier of the film is scheduled for 12.12.12, at the Institute for Vertical Access operatioNs (I.V.A.N. ), the training base of the S.O.S. team. It is part of the 5th Anniversary celebrations of the volunteer organization. For its Anniversary, the team requested Ivan Kristoff to design a commemorative emblematic watch for the “S.O.S.” team. Every time it looks as if an extreme sport couldn’t contain any more inherent risks, there’s always somebody that comes up with a bright idea of how to ratchet up the danger yet another notch. The group of people who challenge or adrenaline rush are from Ivan Kristoff’s International Vertical Access Network, a group of thrill-seekers and extreme stunt performers. To celebrate signing a partnership with our Club Extreme, the equally Bulgarian start-up behind the Institute for Vertical Operations, they have been tempted by the extreme rope access. For the aerial photography and filming the they will use quadro copters and their ability to get right into the heart of the action and capture amazing footage that until recently required a helicopter film crew and a huge production budget. However, why stop at capturing the action when the unmanned aircraft can become a piece of action itself? Music and extreme sports are the focus on our campaign to promote volunteer rescue initiatives. This combination gathers a team of two artists Kiril Milchev & Ivan Kristoff, who aim to attract young audiences, show them through inspiring and motivating ways a positive and useful direction for some community based activities. In 2003, Ivan Kristoff, aka Spiderman, drew the very first Web Wrapping* on the tallest structure in the world. 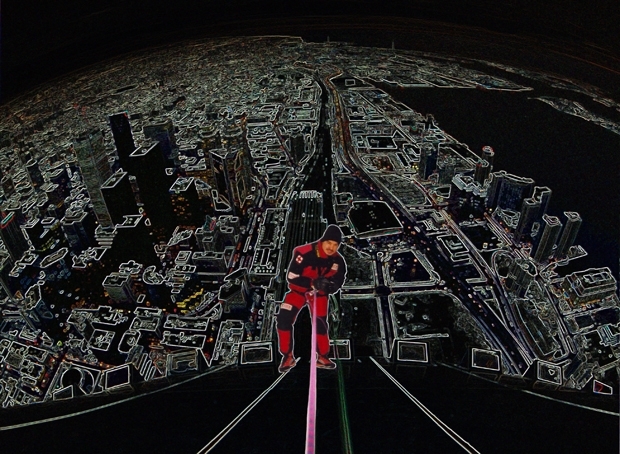 Above the world’s highest public observation gallery, the Sky Pod (previously known as the Space Deck), over 450 metres above the ground, Ivan created a black spider web around the core of the CN Tower. Soaring at 1480 feet, Ivan’s permanent drawing was created in the harshest weather conditions, to which a rope access technician has been exposed at this height. While hanging around and fighting with the strong winds (above 60km/h) the idea to wrap with a web the tops of the world’s tallest buildings was born. 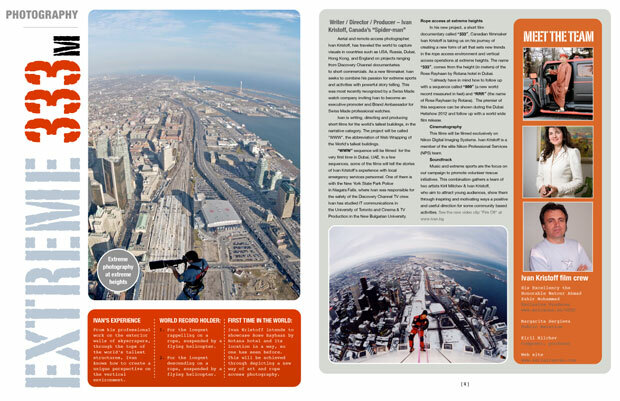 In 1995, the year in which Ivan Kristoff was called for the first time “Toronto’s own Spiderman” in the article “Spiderman on a wall… near you” by the Toronto Sun Newspaper, the CN Tower was declared one of the modern Seven Wonders of the World by the American Society of Civil Engineers and “Canada’s Wonder of the World”. Coincidence or destiny, but Ivan saw a semiotic connection and decided one day to work on his idea to start a project called “WWWW” (Web Wrapping of the Wonders of the World)”. The CN Tower, the world’s tallest tower at a height of 1815 feet and the symbol of Canada, was built to improve communication for the police, firefighters, ambulance drivers, and for those wanting better TV and radio reception. Kristoff, who has worked with the Metropolitan Toronto Police, Toronto Fire Department and 911 emergency services on various project, while studying IT Communications at the University of Toronto, felt that he was the right person for this structure. Up there, Ivan got his adrenalin rush not only from the extreme height but also from the microwave radiation emitted by the radio, TV and cell transmitters. The idea of the CN Tower originated in 1968, when Ivan Kristoff was born. 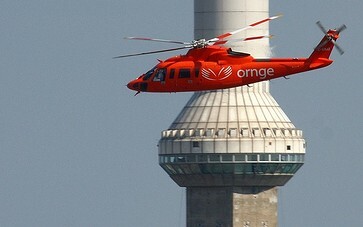 In the winter of 2003, his company was chosen for the contract to do the very first rope access work on the inaccessible areas of the Canada’s landmark – the CN Tower. Ivan was the first man to step on the exterior of the Sky Pod and perform remote access on the Antenna mast. Some people experience acrophobia when looking down at the ground 555 meters below. This is how high Ivan sees the world, under his knees, when standing tall on top of the urban world. Obviously he did not suffer from arachnophobia, since he decided, while doing his job,to draw a black spider web, which can be seen hard from the ground. “The best way to see my high altitude rope access art work is by a flying helicopter”, laughs Ivan. Now Ivan is aiming high at some of the most attractive super high rises with an eye of an artist and a photographer. He is joining forces with his friends, creative team and corporate partners to execute a one-of-a-kind project around the world. Ivan Kristoff studied Semiotics at the U of T, under the guidance of prof. Marcel Danesi, world renowned expert in semiotics and advertising. When Ivan has shared his idea with prof. Danesi, he has been advised to include up to five elements for the name of his project. So, Ivan decided to choose the “Fifth element” of WWWW in the corporate world. After a meeting with the representatives of 3M, where the concept to potential clients was first presented, the name of the new project came to “WWWWW” – Web Wrapping of the Wonders of the World With… For every project or world record, the name in the title will be awarded to the main sponsor of the event. For each project, the author will experiment with different materials for his web. This season Ivan will use the Carbon Fiber Black 3M Scothprint Wrap film, from the Series 1080. 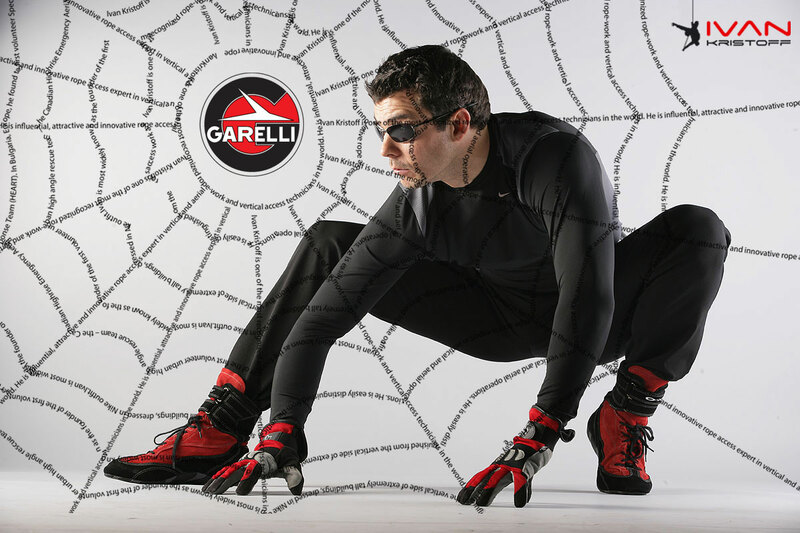 “I am excited to work with the latest innovation of the world leader in commercial graphics -3M,” says the Canadian Spiderman. For his project Ivan traveled around the world and did location scouting on other wonders of the world like the Great Pyramid of Giza, Cairo Citadel, Colosseum, Golden Gate Bridge, Empire State Building, Brooklyn Bridge. For next year he is planning visiting Mount Everest, one of the Seven Natural Wonders of the World. He wants to make a short film called the “65th Anniversary of the climb of Mt. Everest”. Wait for the upcoming news for this exciting and innovative project at the Spider Challenge information page. Club „Extreme”, found by Ivan Kristoff, aka Spiderman, sponsors the audio/visual art with the project Spider-mania. You can join this project when you register on the website Spiderman Challenge. There you will learn about the upcoming vertical/operations of the Bulgarian and Canadian Spiderman. For those who want to capture 3-dimensional photos and video, there is your opportunity to test a new generation of 3D cameras, printers and binoculars. През октомври, 2013г, Иван Кристоф ще представи проекта “Екстремна Спайдер-мания” . Вие можете да заснемете Човека паяк, като го проследите по вертикала и във въздуха. Станете част от снимачния екип на реалния Spiderman, като се включите в невероятни приключения, изживявания и емоции! Членовете на клуб ЕКСТРИЙМ Ви канят да се присъедините към тях и да последвате истинския Spiderman в новите му въздушни акробатики в България. През месец юни, тази година, ще се проведе фото конкурса “Spider-mania/Спайдер-мания”. Всеки фотограф има възможността да заснеме Спайдърмен – Човека паяк по време на престоя му в страната ни. Желаещите да се включат в този проект, могат да се запишат на уеб страницата Spiderman Challenge. Тогава ще бъдеше информирани за предстоящите вертикални и въздушни операции на Човека паяк. За тези, които искат да експериментират с фото и видео камери за триизмерно заснемане, ще имат възможността да тестват ново поколение на 3D апарати, принтери и бинокли. В началото на месец юли, 2012г., очакваме да бъдат представени финалистите от този конкурс и тяхните фотосесии на 3D прожекции в Аулата на Нов български университет, на голям екран в София, Варна, Пловдив, Стара Загора и в култови клубове. Наградата на този конкурс е скутер на италианската марка GARELLI, представена у нас от Иван Кристоф – българския/канадския Спайдърмен. Поканата е отворена за студенти и учащи от други академични организации. ПРОЕКТЪТ: За един ден, екип от ентусиазирани фотографи, видео оператори и фенове на филма Spider-man, ще последват Човека паяк в неговия вертикален свят. Наградата е скутер GARELLI. ЦЕЛТА: За някои, целта ще е да преоткрият нов свят на фотографията, в новото й измерениe и на нови височини. За други, тя ще е да навлязат в нова територия на аудио и визуалните изкуства.